Be sure to check Bleeding Espresso for Part 2 of the World Nutella Day 2010 Round-up! We’re already considering what a 5th year anniversary of World Nutella Day might look like – what about you? If you have any suggestions, please feel free to pass them along via comment, tweet @nutelladay, or on the Facebook fan page (8,500 fans and growing!). On to the rest of the community…..in no particular order, there were so many of your entries! We’re going to add all of these great recipes to the World Nutella Day Recipes page sometime later this week. David Lebovitz pulls out all the stops and makes his own version of Nutella with a homemade Chocolate-Hazelnut Spread. Grazie, David! Jasmine from Amore in Cucina made not one, but two entries: treccia / bread braids with Nutella and Cheesecake with Nutella. Grazie, Jasmine! Maria and Lisa from The Art of Two Tarts takes 4 simple ingredients and make wonderful Nutella truffles! Grazie Maria and Lisa! Paola from In My Life, Banutella Brioche Puddings, little individual bread puddings made with brioche sandwiched with Nutella. Grazie, Paola! Meeta from What’s For Lunch, Honey? will inspire you to try her Black Sesame and Nutella Macarons! Grazie, Meeta! Robin from MyMelange makes Bite-Sized Amaretti and Nutella Sandwich Cookies. Grazie, Robin! Jessica from My Baking Heart made some soft and chewy chocolate fortune cookies filled with Nutella! Grazie, Jessica! Jamieanne from The Sweetest Kitchen made a variation of her fried peanut butter and banana sandwich. Grazie Jamieanne! Pamela from The Cooking Ninja makes Chinese Steamed buns with Nutella filling. Grazie, Pamela! Joanne from Frutto della Passion makes two tasty treats – profiteroles and cannoli! Grazie Joanne! Andrea Meyers takes a good thing and makes it even smaller: Mini Chocolate Whoopie Pies with Nutella. Grazie, Andrea! Sue from Couscous & Consciousness whips up Chocolate Panettone French Toast Sandwiches – a great way to use your leftover holiday panettone! Grazie, Sue! Ivonne from Cream Puffs in Venice tells you to step away from her Nutella and offers you a Nutella Ripple Cheesecake instead. Grazie, Ivonne! Cheryl from Have your cake and eat it! tries to figure out what kind of Nutella lover she is and makes Individual Nutella Tiramisu – I can’t wait to be a guest! Grazie, Cheryl! Haalo from Cook (almost) Anything at Least Once gets naughty with bananas and Nutella and wraps them up into Nutella and Banana Pastries! Grazie Haalo! Emma from The Cake Mistress makes some “ridiculously decadent” Baci Nutella Cupcakes. Grazie, Emma! Deanne from On A Wim drools over her Nutella rolls ready to be eaten. Grazie, Deanne! BonnieBeth from Some Pink Flowers writes a lovely oath to Nutella and the country where they first met: France. Grazie, BonnieBeth! Nastasha from Domestica makes a Nutella Mocha Frappe and an easy Nutella Tart! Grazie, Natasha! Arlene from nyc/caribbean ragazza whips up some French Nutella Toast and uses up some of her precious syrup stock for Nutella Day! Grazie, Arlene! Alessandra from La Casin@ di Ale (Ale’s little home) makes her favorite Nutella cake to share with all of you (in Italian). Grazie, Alessandra! Kathy from Food Lover’s Odyssey remembers her first time with Nutella and makes a Gianduja – Nutella Cheesecake with Nutella Ganache Topping that looks amazing! Grazie, Kathy! Barbara from Art and Barbara Live In Italy swirl some Nutella into a traditional pound cake for a Nutella-Swirl Pound Cake. Grazie, Barbara! Kate from the Kat Eye View of the World shares her most essential recipe with Nutella: a spoon! Grazie, Kate! Mardi from Eat, live, travel, write whips up a marbled baked Nutella cheesecake with a molten Nutella sauce. Grazie, Mardi! Food Hunter’s Guide whips up some orange-Nutella sweet ravioli to not share with her husband! Grazie! 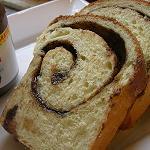 Wic from delicious kitchen therapy makes some delicious Nutella Cinnamon Bread from scratch! Grazie, Wic! Kokomama from My Adventures in Food pipes out some pretty cupcakes with Chocolate Hazelnut Frosting! Grazie, Kokomama! Amy from The Petite Filet makes Chocolate Cupcakes with Nutella Frosting. Grazie, Amy! Allie from Zucchero Dolce makes a homemade praline for her Hazelnut Cake with Hazelnut Florentine, Praline Buttercream, and Nutella Mousse! Grazie, Allie! Linda from Ciao Chow Linda rounds up some of the world’s fascination with Nutella. Grazie, Linda! Stephanie from Plain Chicken posts a roundup of her favorite Nutella creations. Grazie, Stephanie! Susan from My Life’s Joys wraps up some Nutella in wonton wrappers. Grazie, Susan! Eryn Chandler from Cappuccino Chit Chat suggests milk for her chocolate butter cream frosting on her Nutella cupcakes. Grazie, Eryn! Michelle from Culinography takes the chance to make her own Chocolate-Hazelnut Spread. Grazie, Michelle! Rachel from Coconut & Lime mixes creamy cream cheese with Nutella in her mini Nutella Black Bottoms. Grazie, Rachel! Laurel from Un’Americana in Cucina gets spicy and mixes up some Spicy Nutella and Pequin Pepper Truffles. Grazie, Laurel! Karen from Shortbread resists eating from the jar and instead swirls in into rich, buttery pound cake. Grazie, Karen! Silvia from “Ao Longe o Mar” shows you what it looks like to have a double pack of 750g Nutella jars up close (in Portuguese). Grazie, Silvia! Elaine from The Italian Dish recommends keeping one of her Nutella pound cakes on hand and one in the freezer at all times! Grazie, Elaine! James from The Cotswold Food Year ponders the question “Coffee then toast or toast then coffee?” with Espresso, nutella and hazelnut brioche crown Grazie, James! Jayka from The Giant Typo ladles out some Nutella crepes and suggests you add some ice cream on top. Grazie, Jayka! Christina from Mausi swirls up some Nutella into a Nutella Cinnamon Swirl bread. Grazie, Christina! Jen from My Kitchen Addiction rounds up her Nutella recipe favorites and shares a new recipe: Crispy Nutella Treats! Grazie, Jen! anna l’americana from Only in Maine adapts a classic and makes it her own: Nutella and Nutella Streusel-Topped Nutella Banana Bread. Grazie, Anna! F_A from Seelensturm (soulstorm) makes some really yummy Nutella Mozart Cupcakes with almond marzipan, pistachio marzipan, nougat and chocolate. Grazie! Kathleen from Kathleen’s Confections makes something someone should have thought of a long time ago – the CupCrepe – a cupcake built with crepes. Grazie, Kathleen! Åsa from Miss Meister’s mat med mera… tells us what it feels like to celebrate Nutella Day in Sweden! (in Swedish) Grazie, Asa! Patricia from Brownies for Dinner skips brownies this time and makes vanilla bean Nutella sandwich cookies. Grazie, Patricia! Ellen from Mangia, Mangia, Mangia sustains Nutella Day is a holiday she can get behind, and puts it to a test…a Nutella taste test! Grazie, Ellen! Joy from Gourmeted tries her hand at “The Asian Ferrero Rocher” and makes Nutty Nutella Mochi. Yum! Grazie, Joy! Mary from The Food Librarian celebrates just a little smaller with her Nutella Bread Pudding for World Nutella Day. Grazie, Mary! Shannon from Adventures in Food of a Stay-at-Home-Mom rounds up her Nutella recipes for all the fans. Grazie, Shannon! Wandering Chopsticks has a spicy Nutella meltdown with her Mexican Nutella Hot Chocolate with Chilies. Grazie! Vanessa from Chefdruck Musings asks how do you worship Nutella? And answers: with Chocolate Hazelnut Banana Bread. Grazie, Vanessa! Lizzy from Geek Chica had a breakfast of champions to celebrate the day – with Nutella, of course! Grazie, Lizzy! Karen from The Shock of the Old shares a good way to eat Nutella when you aren’t alone, but don’t want to share: the Grilled Nutella sandwich. Grazie, Karen! Isabelle from Eat my Cake now takes a crumble and adds a magic flavor to it to give us Nutella Fudge Squares. Grazie, Isabelle! Sara from Pixel3v Weblog uses a classic “glass” of Nutella and makes some Sorrisi di Sfoglia Ripieni di Nutella (in Italian) Grazie, Sara! Palma from Palmabella’s Passions made a simple but deliciously effective and heavenly Nutella Mousse! Grazie! Achim from Cookelani makes a Torta all gianduia (Schokoladen-Haselnusskuchen) (in German), Grazie, Achim! Carlotta from Kitchen Confidential mixes both almonds and hazelnuts in a cake called Torta Mandonutella (in Italian). Grazie Carlotta! Lindsey from LindseyBee shares where she first fell in love with Nutella – can you guess where? Grazie, Lindsey! Wendy from Pink Stripes doubles up the Nutella in her Nutella and Hazelnut Brownies. Grazie, Wendy! Tracy from Trailer Park Karma waxes about how Nutella is one of the World’s Most Perfect Road Trip Foods. Grazie, Tracy! Grapefruit from Needful Things gets her weekly Nutella fix with a Grilled Nutella Sandwich. Grazie! Something Just To Start swirled Nutella into her Pound Cake. Grazie! Sarah from What Smells So Good? recommends you indulge once or twice a year with her Home-From School Special! Grazie, Sarah! Anali from Anali’s First Amendment wrote a Nutella Day-inspired poem! Grazie, Anali! Raymond from Holland shows us how to make his famous Raymonds Cocktail – orange juice, passion fruit alcohol, eggs, and Nutella – only for the very brave! Looking for more Nutella Recipes? Don’t forget to check the World Nutella Day Recipes page for hundreds of recipes, check more pictures in the World Nutella Day Flickr pool where there are some great shots! Betty Squirrely from Bad Manors Squirrel Diner had her squirrel friends make a special tribute to World Nutella Day: Although we couldn’t use the actual Nutella (squirrels + chocolate = badness) we did EAT all the Nutella, then have the squirrels celebrate the day SAFELY. See you next year on February 5, 2011! Kudos for all the hard work you put into organizing and getting this round up published! Thanks! What Joanne said. This is just amazing!!! Great round-up! You (and Nutella) rock! my kids love that I will try some new ways to bring Nutella on the table. what a wonderful world with nutella!!! What a wonderful year 4! Can’t wait to get through these posts! Thanks for alllll your hard work getting this together. Brava! Awesome! So many wonderful Nutella treats to try. Thanks for putting this all together! Thanks for compiling all the great posts. It was a lot of fun participating. Nutella Day was a very festive day. i just had a foodgasm! nutellasm. Yum, yum … just in time for Valentine’s Day, too. ..so many droolworthy and innovative recipes all in one place…Nutella Day rules!!! Ok that’s it! I have to go buy some Nutella and make some of these fantastic recipes! Thanks for sharing the bounty. All praise the god of Nutella. What a great list of ideas. These look delicious. I think they are just what I need on this cold days.Perfect choice!